Louvered wall vents are easily installed and will be delivered with all mounting hardware. Decorative register covers are available in 15 different finishes. Furthermore, louvered wall vents have an adjustable metal damper for airflow control. 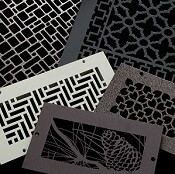 These decorative register covers are offered in 32 distinctive designs. Our louvered wall vents can also be used on the ceiling if need be. Decorative register covers are handcrafted in the USA. Tip: Measure for your new louvered wall vent by measuring the actual hole in your wall. Then you will order that size register. For example, a 10" x 6" hole will need a 10" x 6" decorative register cover. All sizes are width by height unless otherwise requested. The outside measurements will then be larger based on the above table. Important: All louvered wall registers, both standard size and custom size, will take 5 to 8 weeks to be manufactured and shipped. There are rush shipments (2 to 4 weeks) available for an extra charge (please call for information). All decorative register covers are special order, non-returnable and cannot be canceled once payment is received. 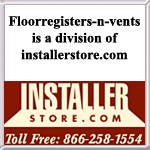 Please call or email us if you have any questions on these vents or need color samples. For a small deposit fee, color samples of the finish choices can be mailed to you. Once returned, the deposit will be refunded. You can place an order online for your samples here. Check out our coordinating wall returns or floor registers for a seamless look. Louvered wall vents will bring a touch of elegance to your home or office, place your order today!